One of the major responsibilities of our Universities is the certification to all those who may be concerned as to the specific qualifications of their graduates. By degree, diploma or transcript they certify that a particular student was indeed subjected to a certain rigorous course of training, and, by various conventions and tests was found to be proficient in certain designated and specific fields. However, while it is universally accepted as being a most important attribute, I know of no University that furnishes a certification for creativity. To the best of my knowledge, this is left solely to the Patent Office. 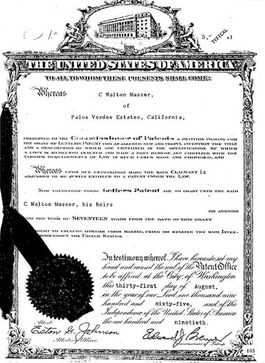 The Patent Office does offer such certificates covering many lines of Endeavor - they are called Patents. In this specific capacity they play a very important role in the relevant art or science methodically review the prior art, and, by the issuance of the Patent certify that the named inventor was creative. The creativity and value of the inventive contributions of Walt Musser and the protection thereof by patenting is demonstrated by the sheer number of patents issued to Mr. Musser. Walt Musser is credited with over 250 major inventions and discoveries. Some of them are the Army recoilless rifle, aircraft personnel catapults, instrumentation for underwater detonation testing, automatic machine guns, hollow charge projectiles, mechanical and electronic oscilloscopes, heat cells, guided missiles, sporting arms, jet engine test cells, inventor of strain wave gearing ... and dozens of additional devices and types of equipment for industrial, commercial and defense use. For a complete list of patents: The Patents listed in the US Patents and Foreign Country Patents.